Maia Weinstock is the creator of the Women of NASA Lego set that the company recently announced it will be producing as part of its Lego Ideas program. Lego announced on Tuesday (Feb. 28) that it would be making a fan-created set called "Women of NASA," featuring five important women who have worked for the agency. Maia Weinstock, the set's creator, recently talked with Space.com about what motivated the project. Weinstock built the set and submitted it to the company's Lego Ideas website, which lets fans propose sets that the company should manufacture. Each set submitted to the program first goes through a public vetting process, in which the set must receive 10,000 votes from the public before being considered by the company. Previous Lego Ideas sets that have made it to production include the Big Bang Theory set, the Doctor Who set and the Research Institute set, featuring female scientists and science props, which was proposed and developed by geoscientist Ellen Kooijman. Weinstock is a science writer and editor who currently works as the deputy editor of MIT News at the Massachusetts Institute of Technology. (Full disclosure: Weinstock worked as a staff writer for Space.com in 2000.) 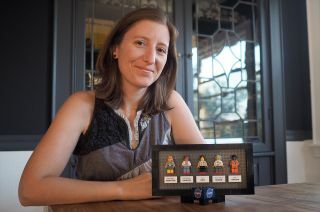 Her Twitter feed reveals that she has a history of using Lego as a tool for science outreach: For about seven years, Weinstock has been creating Lego minifigures in the likeness of scientists and science communicators, and posting photos of them online. The Women of NASA Lego set will include minifigures modeled after computer scientist Margaret Hamilton, mathematician Katherine Johnson, astronaut Sally Ride, astronomer Nancy Grace Roman and astronaut Mae Jemison. The Lego set features minifigures of five important women from NASA's history, along with scenes and props associated with each one. The five women represented in the set are Sally Ride, the first American woman in space and a STEM (science, technology, engineering and math) outreach specialist (Ride died in 2012); Mae Jemison, the first African-American woman in space and also a STEM outreach specialist; Katherine Johnson, a NASA mathematician and computer (the title given to people who did computations before the advent of electronic computers), and a central focus of the movie "Hidden Figures"; computer scientist Margaret Hamilton, who led the development of the onboard flight software for the Apollo missions to the moon, and who received the Presidential Medal of Freedom in 2016; and astronomer Nancy Grace Roman, referred to by many as the "Mother of Hubble" for the role she played in the planning for the space telescope. Maia Weinstock: I came up with the idea sometime in 2015. I had actually proposed another set on Lego Ideas that was not related to science, but at a certain point I just decided to focus on a new project and go towards the area that I have much more experience with, and that is space. I've also done a lot of research on the history of women in science and engineering. So I thought [the project] would be a perfect combination of highlighting women in STEM and also highlighting women who have contributed greatly to NASA. I decided to work on specific women, instead of generic women. [Editor's note: The Research Institute Lego kit features minifigures that are not modeled after specific scientists.] Because I thought this would be something different. And this is something I am passionate about, which is bringing [science] personalities to light. It was a risk. I mean, nothing like this has ever been posted [to Lego Ideas] before, at least in terms of women. I submitted it, and then there's this process where you have to get enough votes from the community. But it's really hard to get 10,000 votes, actually, as I had actually learned in the previous year with another set that I tried out. And somehow we got to 10,000 within two weeks! So clearly, this touched a lot of people and inspired a lot of people. So it was pretty quick, but it's been a long waiting game since then because the review period [by Lego] didn't actually start until, I think, September. And I actually did hear back from the Lego folks a little while ago [that the set had been accepted], but I wasn't allowed to say anything. But I have been in touch with the Lego Ideas team for a little while. And I'm just really ecstatic about this whole thing. It's been a fun journey. Space.com: So, choosing to do a set about Women at NASA goes along with your career writing about space and science, but tell me a little more about why you selected these particular women. Weinstock:I actually have a blog post that goes into some detail about how I made this decision. Because a lot of people have actually said, "This is great, but where's this person?" Or "How come you didn't choose that person?" So I decided to just lay it all out there. But, essentially — part of it is thinking about trying to get people to vote for it. On the one hand, I had to have some people who are well-known, otherwise nobody would care. But on the other hand, my goal was to try to highlight people who weren't as well-known. So I started with Sally Ride, because I love her and everyone loves her and she is sort of this icon of space travel but also of being someone who really promotes women in the sciences and in STEM. I started with her; that was, like, a no-brainer. But then, I started trying to figure out what other women should I include, and I wanted to make sure that I included people in various fields, so engineers as well as astronauts and scientists. I also wanted to convey diversity of backgrounds, diversity of races, diversity of ages. [For example] I specifically made sure that I showed Nancy Grace Roman as she is now [Ed. note: Roman is 91 years old], and then some of the other ones I decided to show as they were when they were younger. Just to kind of give a sense that women of all ages and backgrounds have contributed to NASA history and have been awesome. Space.com: So, obviously, the response from the public was positive, as you got 10,000 votes in two weeks. Have you received any more specific feedback from NASA or from anyone who is represented in the set, or any other interesting people? Weinstock: NASA did actually tweet about it over the summer, which was, you know, thrilling! [NASA astronaut] Mae Jemison is the only person who is on Twitter who is in the set and she was tweeting about it, so that was cool. Some of the folks from the "Hidden Figures" movie really did help out. There was Pharrell Williams [who composed the music for "Hidden Figures"] who tweeted about it. And Janelle Monáe [one of the actors from "Hidden Figures"] put it on Instagram, so that was helpful. And then a couple of astronauts, like Mike Massimino, posted about it ― people like that. So that was great. And people like the Girl Scouts were tweeting it, so that was cool. Space.com: What about the response from the general public? Weinstock: One of the things I think really [gave me] the sense that this set could go far, was that people weren't saying, "Oh, that's a cool idea," they were actually saying to me, "I need this!" I had so many people saying, "Just take my money!" or "What do I need to do to get this set?" They were just demanding it, like they have to have it, as opposed to something that's nice to have but it's just an option. I had tons of people commenting on how they wished that they had had this kind of toy when they were kids. And it's been amazing. Space.com:I know you make Lego minifigures of scientists and science personalities. Were you already a Lego fan? Weinstock:The story goes that I really hadn't played with Legos since I was a kid; I didn't really have anything to do with them until about 2009, when I was inspired to make [a Lego minifigure] as a gift to my friend Carolyn Porco, who is a planetary scientist. I thought it would be really cool to make one in her likeness. So I did, but not in any public way, and she liked it, and I decided to make more. And so, it sort of became a hobby to make these figures and then photograph them and then put them out on Twitter. And I specifically wanted to do that because I wanted people to see that there were scientists out there and you could follow them [on Twitter] and get to know them, and that they're not just these nerdy people off in some university hall, they're actually interesting people and they have really cool work, obviously, but also interesting lives. So, yeah, I have been making just individual minifigures of scientists and engineers since then. Space.com: So, will the Lego company make any major adjustments to the set, and will they talk to you about any changes they make? Weinstock: They currently have a design team that is tweaking it and making the set the way that they think it should be. Basically, it's out of my hands at this point. And I believe I will have an opportunity to provide some feedback, but it's really theirs now. So I'm not really sure how that's going to go. Space.com: Does the success of this set make you feel like you might submit another one, or is this just a one-off? I have one other project that I'm working on, but I don't honestly think they would make it. So I'm actually less inclined to submit another one at the moment. But if I come up with another idea that I think would do well, I certainly would submit it. I mean, this has been a kind of all-consuming process for certain amounts of time, — I was very lucky that I only had to campaign for two weeks. So I think I probably will rest on my laurels a little bit in this case and just enjoy this a little more.